Rayovac Ultra Pro 9-volt Premium Alkaline Batteries. Expiration Date: Nov 2022. 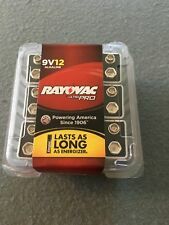 18 RAYOVAC 9V ULTRAPRO BATTERIES EXP NOV 2022. FREE USPS SHIPPING. BRAND NEW MANUFACTURE PACKAGING. 3 PACKAGES OF 6 BATTERIES EACH..
Trending at $15.44eBay determines this price through a machine learned model of the product's sale prices within the last 90 days. 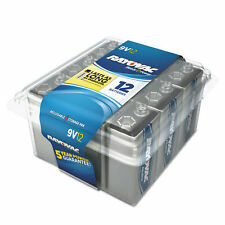 Rayovac 9 volt batteries 12 in a box Each battery is individually packed. Rayovac alkaline batteries are a great choice for powering up your electronic gadgets. Rayovac batteries are long-lasting power sources and are ideal for daily usage. With Ready Power. Rayovac® batteries provide premium performance at a wallet-friendly price. High-quality materials ensure dependable, long-lasting power for portable electronics. Ten-year shelf life. Excluded are Alaska, Hawaii, Puerto Rico, APO/FPO, PO Boxes and International locations. Expires: 2021. 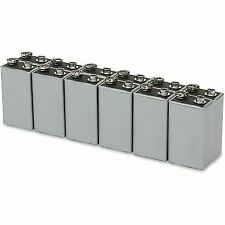 12 EACH 9 VOLT ALKALINE BATTERIES. 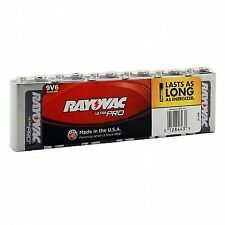 Rayovac AL-9V Battery Ultra Pro Industrial Alkaline Batteries 6/pk Condition is New. Alkaline for longer battery life. Dependable performance. Longer battery life. Excluded are Alaska, Hawaii, Puerto Rico, APO/FPO, PO Boxes and International locations. High energy™ 9V alkaline batteries are ideal for high use devices including toys, flashlights, wireless mice and more. Compare to Energizer! We take our reputation seriously! Up to 10 years storage life. 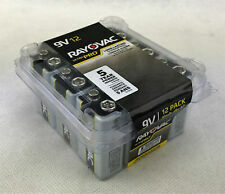 6 Rayovac AL9V-12 UltraPRO Alkaline 9V Batteries. This Rayovac Ultra Pro 9V Alkaline battery is specially engineered for professional use. 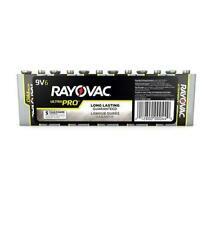 Rayovac Ultra Pro - 9V Size - Alkaline Battery - Industrial Grade - AL9V-8 is rated4.0 out of5 by1. The general shelf life date of 9V batteries is not seven years. It is five. getting very new batteries. life of five years. Item model number:AL9V6J. 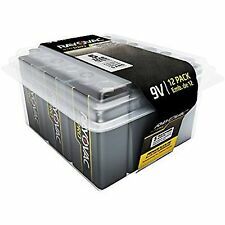 12 Rayovac AL9V-12 UltraPRO Alkaline 9V Batteries. This Rayovac Ultra Pro 9V Alkaline battery is specially engineered for professional use. Rayovac Ultra Pro - 9V Size - Alkaline Battery - Industrial Grade - AL9V-8 is rated4.0 out of5 by1. Combine safety and security with this 9V lithium battery. 10-year service assure long-lasting performance. Battery Type: Lithium Battery Size: 9V. • Lasts 2x Longer Than 9v Alkaline In Most Other Devices. (These top-performing 9V batteries have been specifically designed for use in portable digital electronics ideal for the modern lifestyle. Guam, Puerto Rico, Virgin Islands, etc.). Check-Out Now! 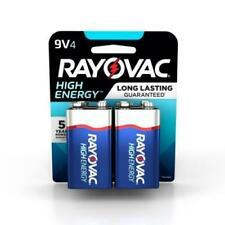 RAYOVAC - A1604-4J 9V 4 High Energy Battery. Dependable power wherever you need it. Rayovac alkaline batteries last as long as the competition but cost less, providing unbeatable value. Long Lasting - Provides long lasting power in high use devices. Dependable power wherever you need it. Rayovac® alkaline batteries last as long as the competition but cost less, providing unbeatable value. Excluded are Alaska, Hawaii, Puerto Rico, APO/FPO, PO Boxes and International locations. Seven-year shelf life. Excluded are Alaska, Hawaii, Puerto Rico, APO/FPO, PO Boxes and International locations. Also known as: MN1604, PP3HP, 006P, 6LR61, 6LF22, AM6F, 6LF62, 9 VOLT, HP3, Mallory M1604, Ever Ready 216. Model: A1604. Performance when it counts!Rayovac Industrial 9V Alkaline Batteries are specially designed to provide users with a power reservoir that enables them to last longer - even under the abuse they're likely to take in industry and professional applications. Rayovac UltraPro 9V Alkaline Battery - Batteries contain mercury-free formula which is better for the environment and are guaranteed against leakage. Recloseable contractor packaging helps organize and protect batteries from damage and short circuiting. - Type: 9V, Battery Power Type: Alkaline, Capacity: 500 mAh, Voltage: 9V, Warranty: 5 Yr. Shelf Life, Pkg Qty: 12, Package Type: Box. Lasts as long as other leading brands High performance alkaline Ideal for toys, flashlights and smoke alarms This lot is for 2- 4 packs of batteries. Total of 8. Dependable power wherever you need it. Rayovac. Alkaline Battery Dependable power wherever you need it. Rayovac® alkaline batteries last as long as the competition but cost less, providing unbeatable value. Battery Type: Alkaline. Material(s): Alkaline. High Energy Premium Alkaline Battery Dependable power wherever you need it. Rayovac® alkaline batteries last as long as the competition but cost less, providing unbeatable value. Material(s): Alkaline. You can count on Rayovac 9V Heavy Duty Batteries for maximum performance and to keep your devices running longer. Battery Chemistry: Zinc Chloride. Heavy duty batteries. Product Weight: 1.5oz. Great way to power low-drain devices. Battery Type: Alkaline. Battery Size: 9V. Material(s): Alkaline. Product Title Rayovac Alkaline 9 Volt Battery (A16044CTF2). Rayovac batteries provide premium performance at a wallet-friendly price. High-quality materials ensure dependable long-lasting power for portable electronics. Rayovac Ultra Pro batteries are engineered for professional use to deliver dependable performance. Battery Type: Alkaline; Battery Size: 9V; Voltage: 9 V; Material(s): Alkaline. Dependable power wherever you need it. Rayovac alkaline batteries last as long as the competition but cost less, providing unbeatable value. Battery Type:Alkaline Battery Size:9V. Global Product Type:Batteries-Alkaline Battery Type:Alkaline. Battery Type: Alkaline. Material(s): Alkaline. Battery Size: 9V. Global Product Type: Batteries-Alkaline. Dependable power wherever you need it. Rayovac alkaline batteries last as long as the competition but cost less, providing unbeatable value. Mercury-free formula is guaranteed fresh for years. Battery Type: Alkaline; Battery Size: 9V; Voltage: 9 V; Material(s): Alkaline. Dependable power wherever you need it. Rayovac alkaline batteries last as long as the competition but cost less, providing unbeatable value. Mercury-free formula is guaranteed fresh for years. Battery Type: Alkaline; Battery Size: 9V; Voltage: 1.5 V; Material(s): Alkaline. The batteries have never been used. Rayovac Lasts as Long as Energizer Max. The general shelf life date of 9V batteries is not seven years. It is five years. Batteries 6 Nonstandard Battery batteries required. Item model number: AL9V6J.